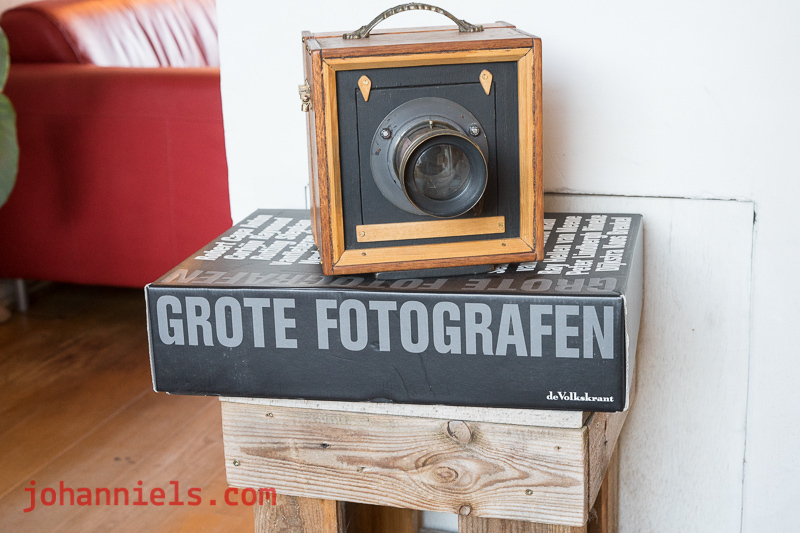 Suitable pedestal for a large format camera. 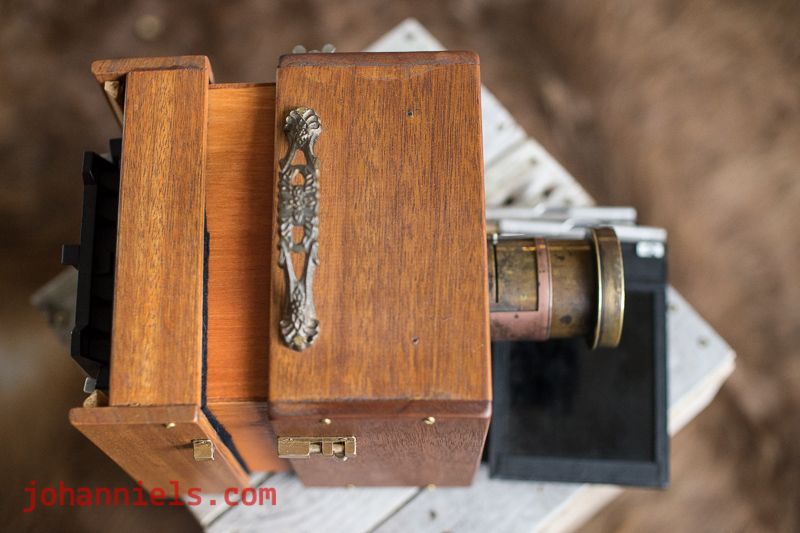 The design of this camera is over a century and a half old. It consists of two wood boxes, that slide in one another. 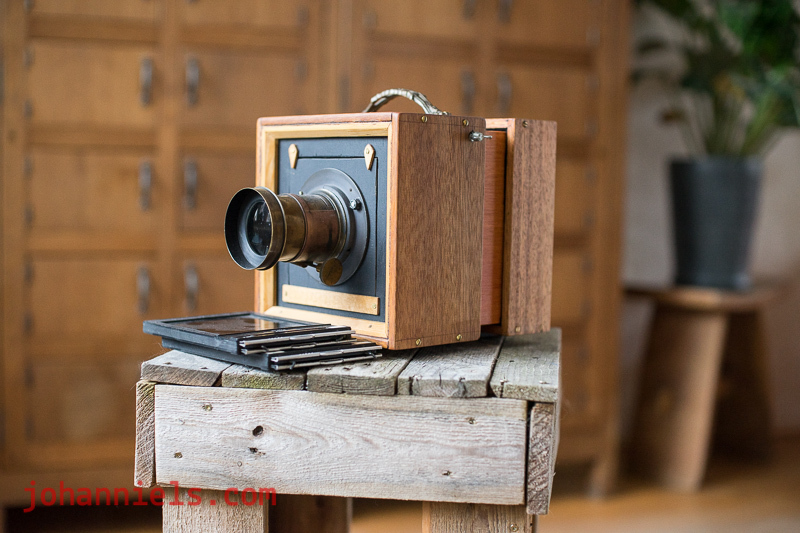 The one half holds the lens on the front, the other holds the ground glass and film plane on the back. 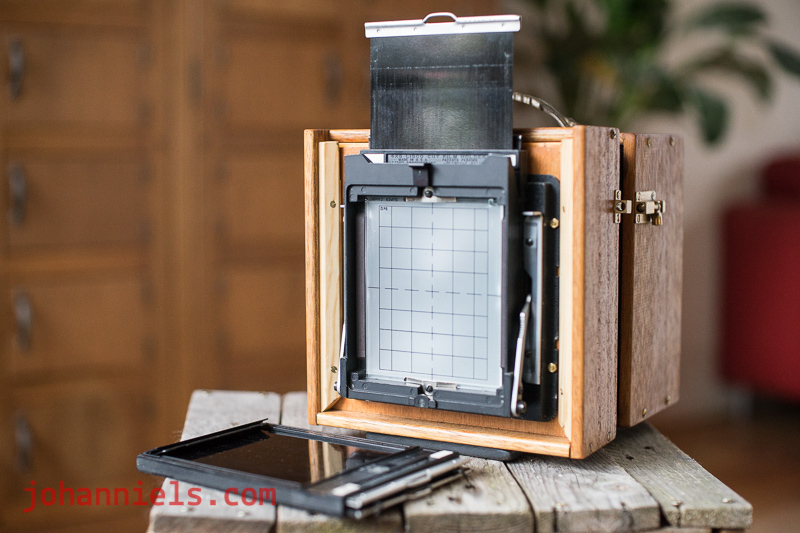 By sliding the one box into the other, you focus the upside down and mirror reversed image on the ground glass, and lock it down with the butterfly nut on the left top side. I light proofed it with black felt between the two parts, and painted the inside of the camera flat black with black slate paint. There is no shutter. I know I won't be able to shoot an image in bright daylight, but that was never the goal with this camera anyway. I'm taking my time until light has faded enough for the camera, the lens and the slowest film I can get my hands on, haha! So once the light is fading, I stop the lens down as much as the available light requires. Do my math on the exposure and make sure I choose an exposure that is at least several seconds long. no need to rush, right? Next, insert a film holder with the sheet film inside. Cover the lens with my hand or something else that is 100% light tight. 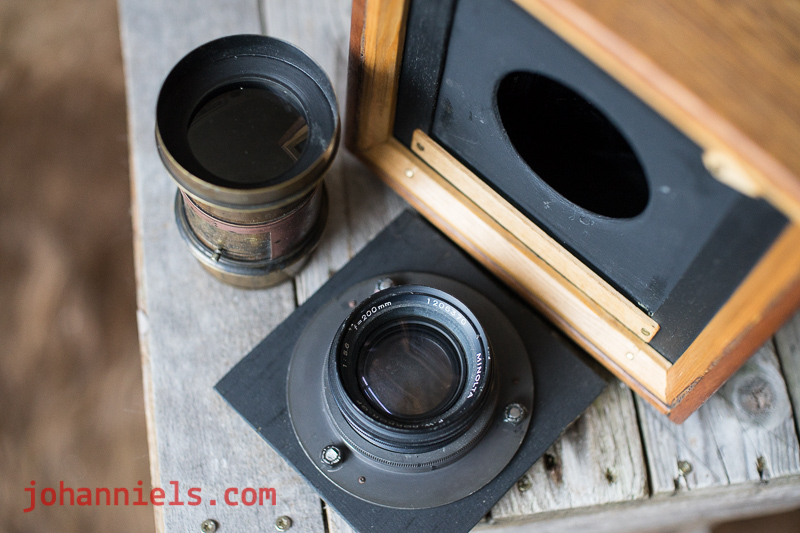 Remove the dark slide from the film holder and make sure everything is steady, before uncovering the lens. Slowly count the correct amount of seconds, then quickly cover the lens up again, before putting the dark slide back into the film holder. Next shot, repeat with the other sheet of film in the (double sided) film holder. 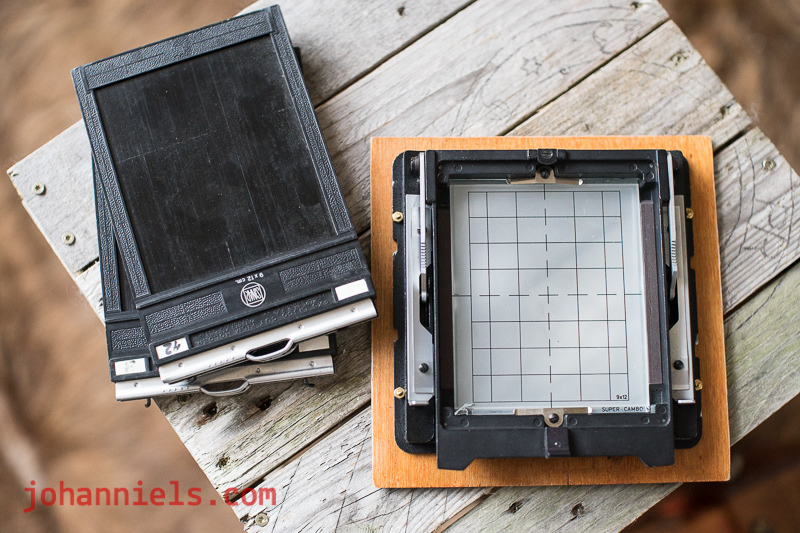 Two 4x5 inch film holders lying in front of the camera. The lens is unmarked, but totally unscientific testing revealed it to be approximately 180mm focal length. And an aperture of about 3.5 wide open. I fitted the camera with a bolt lock in brass, that actually needs a bit of friction to really lock the camera parts together. For once, being poor at measuring things out was a benefit! The back of the camera is a simple plywood plate, but I got hold of the rear part of an old Cambo camera and drilled four holes in it to mount it to the plate. Of course I had to use brass bolts and nuts, it's gotta be in era-correct style, right? Haha! 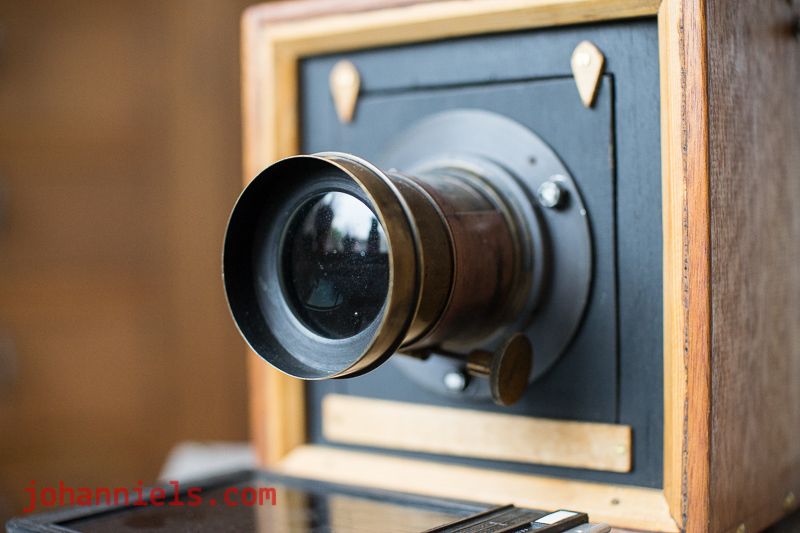 Fact is I did not want to go through the hassle of creating a completely self-made camera back, since it requires microscopic precision to get a sharp image and I know how well I would do with that bit of the build... The Cambo back set me back about 40 Euros so that was okay. It had everything I needed all at once, and took maybe 30 minutes to get fully tailored to the camera. Dumb luck was involved too, or I wouldn't have succeeded. Simple as that, I'm admitting to it. 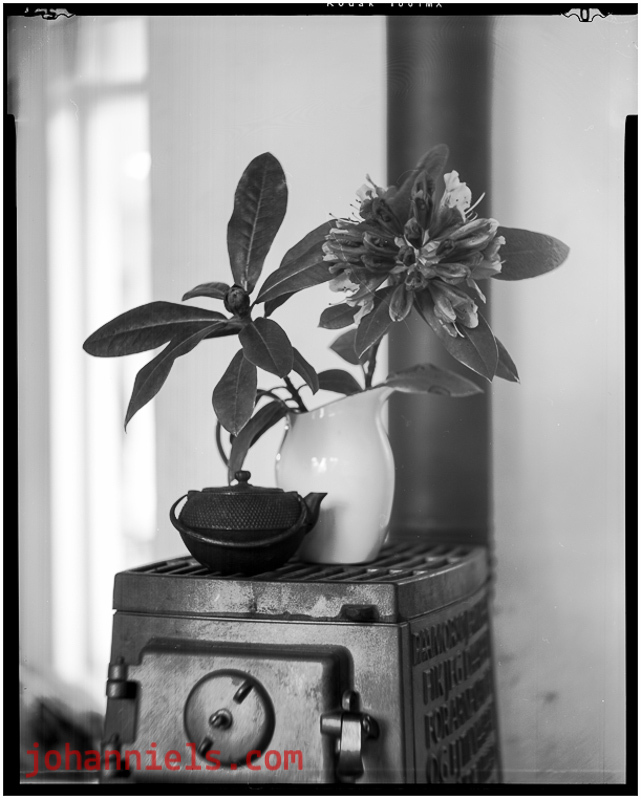 I had the Rokkor 200mm 5.6 reproduction lens from an old Xerox machine lying around already. And it had the big metal mounting flange with it. But, no aperture in that lens of course. BLIMEY! It was an exact match, down to the pitch of the threads! Screwed right in! The Rokkor actually reaches infinity on the camera, the 180mm barrel lens just doesn't, the camera is too deep. My bad, I'm bad at measurements. But, it's nice as a portrait lens anyway, and focus is between 1.5 and 3 meters. Sharpness is very nice, out of focus areas are nice and smooth too! We have a winner, in my book! Here's a result from the camera in my living room, with all the math done correctly and 100 ASA Tmax film used. This was a 4 second exposure. I'm pretty pleased with it!